Shopping for a new cordless drill can be overwhelming. For starters, any given manufacturer may offer dozens of drills. Put them all together and you’re choosing among hundreds of options. CR narrowed down the field to 40 of the most widely available models and ran them through a series of tests in our lab. CR members can compare the complete test results in our cordless drill ratings. We perform the bulk of our tests on a benchtop instrument called a dynamometer. It measures torque under different loads, and we use those readings to derive scores for power, speed, and run time. If you were to add up all the energy expended by the drills during testing and apply it to the real world, you could build fifty-seven 300-square-foot wood decks, using 80,742 screws. “Across the board, we’ve seen cordless drills improve in the past decade,” says Frank Spinelli, who tests drills for Consumer Reports. Spinelli also notes that as lithium-ion battery technology advances, drills are getting lighter and more energy-efficient. Below you’ll find 10 of the best cordless drills from our tests, divided into categories—general-use, heavy-duty, and light-duty—and listed alphabetically (not in order of CR rank). For more details on drill types, see our cordless drills buying guide. 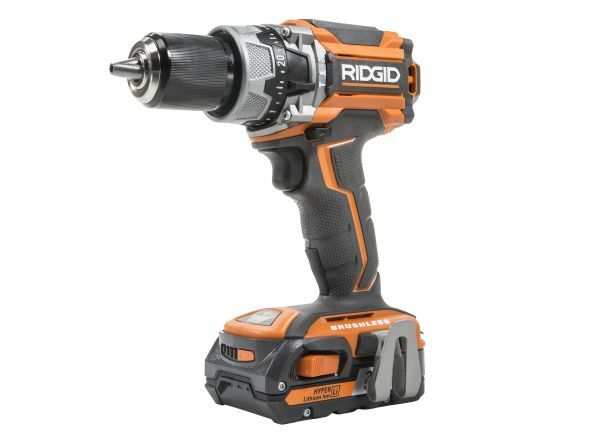 CR’s take: This 12-volt drill is one of only two models with a brushless motor in our general-use category. 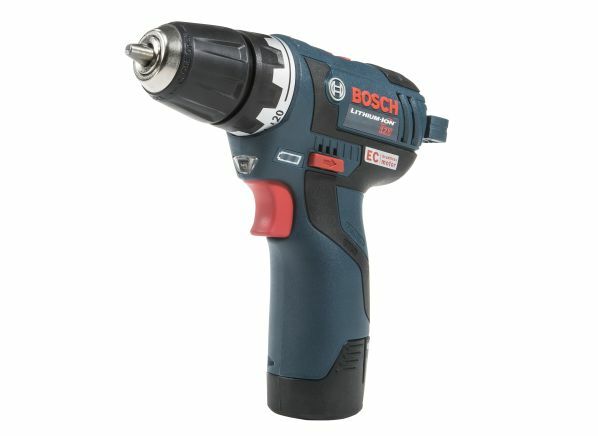 That means the drill can deliver a tad more power than if it used a traditional “brushed” motor; it also means it will run longer on a charge and probably have a longer lifespan. The Bosch is a favorite among CR staffers and earns an Excellent rating for handling because it weighs only 2 pounds—less than half the weight of a number of heavy-duty drills we tested. The slim, pistol-grip profile makes it easy to wield but also prevents it from standing upright when not in use. The compact size lets you maneuver the drill into the most awkward of positions yet also accommodates a built-in LED light and bit storage. What’s included: Two 2-amp-hour batteries, five bits, and a soft-sided case. 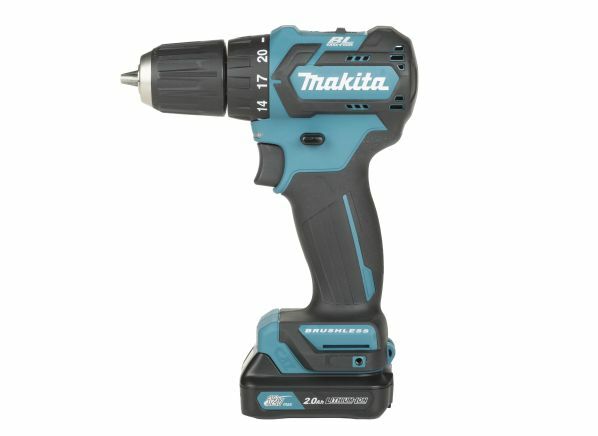 CR’s take: This Makita is the only other brushless model in our general-use category (in addition to the Bosch above). It weighs just over 2 pounds and stands barely 6 inches tall. Despite its slim profile, the Makita earns an Excellent score in our power test and packs a serious punch—making it a solid alternative to some of the larger, 18- and 20-volt models. It earns a rating of Good for run time, and the kit comes with two batteries and a rapid charger, which tops off an empty battery in an impressive 60 minutes. What’s included: Two 2-amp-hour batteries and a hard-sided case. CR’s take: This dynamo can drill fast, garnering it an Excellent rating for speed. It’s also one of the few high-scoring heavy-duty models under $200 in our tests. The Craftsman has two speed ranges: zero to 600 rpm is perfect for precision drilling; up to 2,100 rpm will make short work of boring pilot holes into wood. What’s included: Two 2-amp-hour batteries, a belt clip, and a soft-sided storage bag. 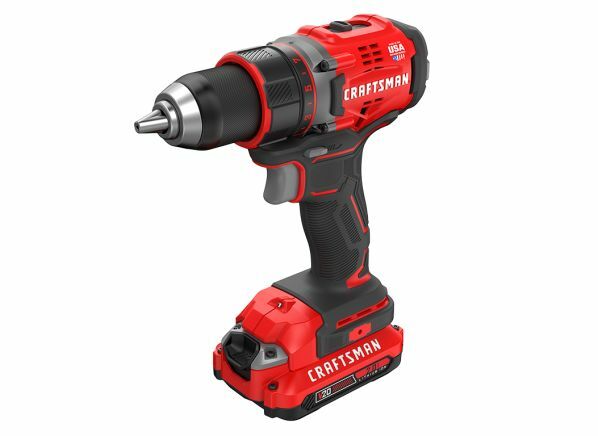 CR’s take: This 20-volt drill is neither as brawny as the biggest 18-volt drills we tested nor as balanced as the best 12-volts. But by splitting the difference between those extremes, this model may be the Goldilocks of cordless drills, earning a Very Good score for handling. It’s compact enough that you won’t tire when swapping out an overhead light fixture but forceful enough to bore holes in hardwood without bogging down. It’s well worth considering if you’re torn between voltage ratings. This DeWalt has a phone app that allows you to check diagnostics, such as battery life, temperature, number of trigger pulls, and more. 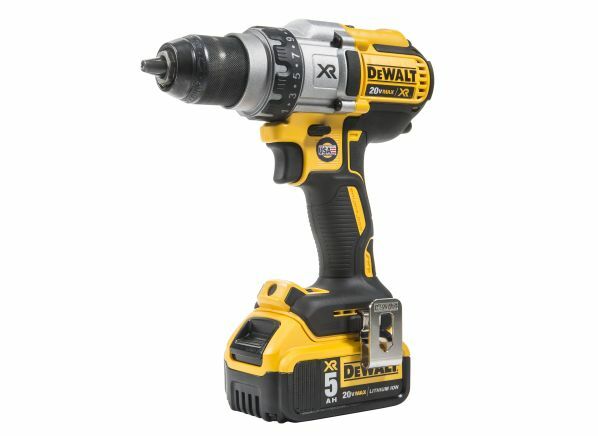 CR’s take: This 20-volt DeWalt is one of our top performers, snagging Excellent ratings for power, speed, and run time. 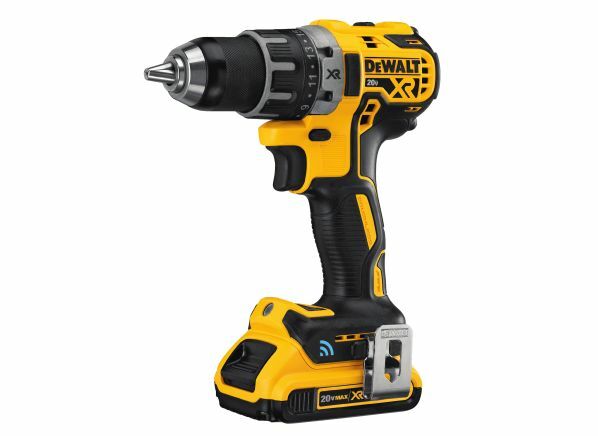 However, the hefty 5-amp-hour battery that produces all that power makes this drill heavy, unbalanced, and a bit awkward to handle, which is why it earns a Fair in our handling assessment. Weighing in at 4.7 pounds, it’s at least 1 pound heavier than most other heavy-duty drills and more than double the weight of some 12-volt models we tested. Unlike most drills in our ratings, this one is equipped with three speed settings, providing a handy middle option for drilling into soft metals such as aluminum, when the slow speed required for steel isn’t enough and the fast speed for wood is too much. What’s included: Two 5-amp-hour batteries and a hard-sided case. 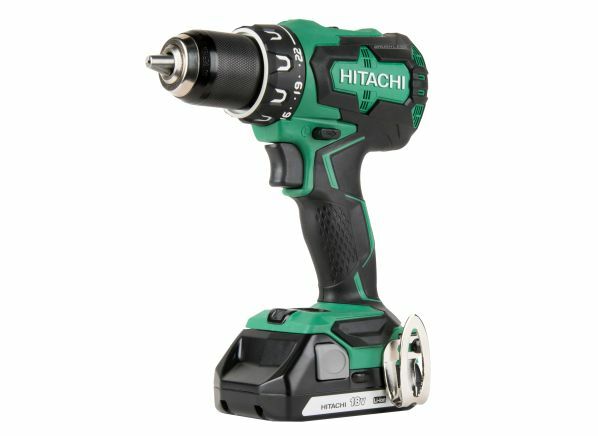 CR’s take: For drilling into wood, drywall, or various composite materials, this Hitachi is more than adequate. It’s great for sinking screws, too, with 23 clutch settings to help you avoid damaging fasteners or hardware. The battery doesn’t run as long as the batteries in the very best drills, but this model comes with two, so you can always have one charging. 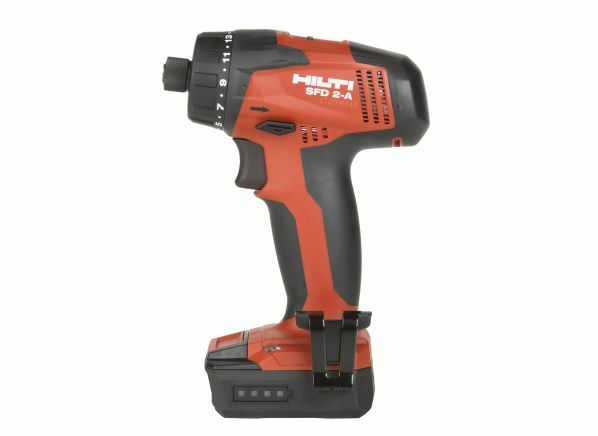 And while many 18-volt batteries take hours to reach a full charge, the 1.5-amp-hour battery on this drill takes just 45 minutes, earning a Very Good rating for charge time. The batteries come with a respectable two-year warranty, and the drill itself is covered for—brace yourself—a lifetime. That’s rare in the world of drills. What’s included: Two 1.5-Ah batteries, a belt hook, a single Phillips-head bit, and a hard-sided case. CR’s take: Exclusive to Lowe’s, this 4-pound bruiser is a whole lot of drill for the money. 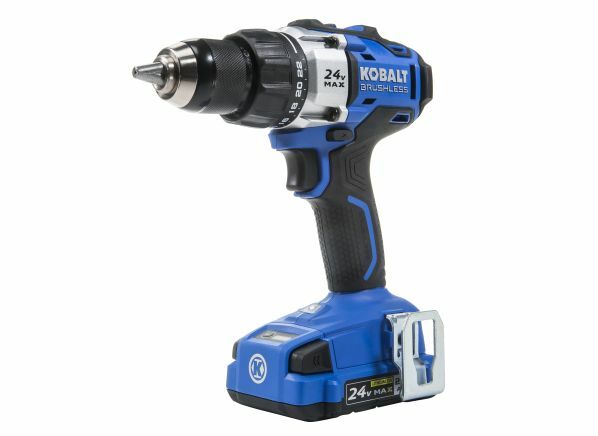 One way Kobalt keeps costs down is by giving you only one battery, albeit a potent 24-volt unit. Consider buying a second battery, $50, for larger projects and always keeping one on the charger. This model will drill plenty of holes fast, which earns it an Excellent rating in our speed test. It’ll perform well enough to serve as a tackle-any-task option for the average homeowner. What’s included: One 2-amp-hour battery, a removable side grip, a double-ended driver bit, and a soft-sided case. What’s included: Two 2-amp-hour batteries, a belt hook, an auxiliary handle, a double-ended bit, and a soft-sided bag. CR’s take: This unique drill falls in our light-duty category because of the limitations of its fixed, ¼-inch chuck. That’s not a problem, though, if you’re not drilling large holes. Plus, it goes for half the price of many cordless drills with similar capabilities while still proving reasonably powerful. A built-in LED light helps illuminate your workspace, while the drill’s modest 2.2-pound weight minimizes strain and fatigue, earning it an Excellent rating for handling. One of the biggest selling points is perhaps the 20-year warranty, which goes far beyond the standard three years for cordless drills. What’s included: Two 2.6-amp-hour batteries, a belt clip, and a soft-sided case. 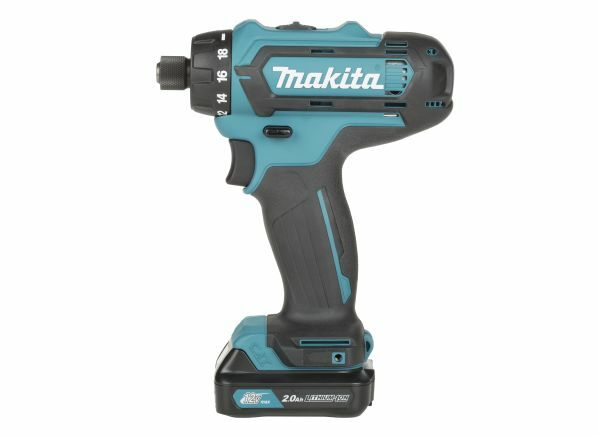 CR’s take: While it’s not the right choice for anyone who needs to sink thousands of screws, this 2-pound Makita is the right tool for the discerning but budget-conscious hobbyist. It provides solid performance in a compact design, ideal for tight spaces and overhead tasks such as putting in a ceiling fan. It is lightweight and ergonomic, and it handles like a dream, earning an Excellent score in that test. While the ¼-inch chuck is not as versatile as the chucks of general- and heavy-use drills, it gets light drilling and driving jobs done, and done well. A multidimensional background in lifestyle journalism, recipe development, and anthropology impels me to bring a human element to the coverage of home kitchen appliances. When I'm not researching dishwashers and blenders or poring over market reports, I'm likely immersed in a juicy crossword puzzle or trying (and failing) to love exercise. Find me on Facebook.